(Phys.org)—A team of researchers with the Center of Planetary Science (CPS) has finally solved the mystery of the "Wow!" signal from 1977. It was a comet, they report, one that that was unknown at the time of the signal discovery. Lead researcher Antonio Paris describes their theory and how the team proved it in a paper published in the Journal of the Washington Academy of Sciences. Back in August of 1977, a team of astronomers studying radio transmissions from an observatory at Ohio State called the "Big Ear" recorded an unusual 72-second signal—it was so strong that team member Jerry Ehman scrawled "Wow!" next to the readout. Since that time, numerous scientists have searched for an explanation of the signal, but until now, no one could offer a valid argument. Possible sources such as asteroids, exo-planets, stars and even signals from Earth have all been ruled out. Some outside the science community even suggested that it was proof of aliens. It was noted that the frequency was transmitted at 1,420 MHz, though, which happens to be the same frequency as hydrogen. The explanation started to come into focus last year when a team at the CPS suggested that the signal might have come from a hydrogen cloud accompanying a comet—additionally, the movement of the comet would explain why the signal was not seen again. The team noted that two comets had been in the same part of the sky that the Big Ear was monitoring on the fateful day. Those comets, P/2008 Y2(Gibbs) and 266/P Christensen had not yet been discovered. The team then got a chance to test their idea as the two comets appeared once again in the night sky from November 2016 through February of 2017. In 2016, the Center for Planetary Science proposed a hypothesis arguing a comet and/or its hydrogen cloud were a strong candidate for the source of the "Wow!" Signal. From 27 November 2016 to 24 February 2017, the Center for Planetary Science conducted 200 observations in the radio spectrum to validate the hypothesis. The investigation discovered that comet 266/P Christensen emitted a radio signal at 1420.25 MHz. All radio emissions detected were within 1° (60 arcminutes) of the known celestial coordinates of the comet as it transited the neighborhood of the "Wow!" Signal. During observations of the comet, a series of experiments determined that known celestial sources at 1420 MHz (i.e., pulsars and/or active galactic nuclei) were not within 15° of comet 266/P Christensen. To dismiss the source of the signal as emission from comet 266/P Christensen, the position of the 10-meter radio telescope was moved 1° (60 arcminutes) away from comet 266/P Christensen. During this experiment, the 1420.25 MHz signal disappeared. When the radio telescope was repositioned back to comet 266/P Christensen, a radio signal at 1420.25 MHz reappeared. Furthermore, to determine if comets other than comet 266/P Christensen emit a radio signal at 1420 MHz, we observed three comets that were selected randomly from the JPL Small Bodies database: P/2013 EW90 (Tenagra), P/2016 J1-A (PANSTARRS), and 237P/LINEAR. During observations of these comets, we detected a radio signal at 1420 MHz. The results of this investigation, therefore, conclude that cometary spectra are detectable at 1420 MHz and, more importantly, that the 1977 "Wow!" Signal was a natural phenomenon from a Solar System body. A new cometary orbital period: Wow! -> meh. in 40 years. they tested readings from three other comets, as well, and found similar results. So we'll just have to wait for any one comet to verify this. Not sure if this explanation is 100% airtight, but it appears to be a reasonable, science-based alternative to simply assuming we intercepted an alien message back in 1977. This is a reminder that intelligent aliens doing wacky and detectable things nearby is always the last answer you want to consider for any perplexing phenomenon like the variable light of KIC 8462852. Given the vastness of the universe, aliens capable of using radio technology are probably out there, but it seems clear they are either intentionally keeping a low profile, don't use radio signals, or don't use radio signals we are set up to detect at the moment. The comet is really a probe exploring our planetary system. Or some flunky wrote "Wow", was wrong, and you can't get over it. That team of researchers with the Center of Planetary Science (CPS) is full of aliens. I learned this from surviving Heavens Gate member(s). While the comet theory is possible, so is an alien transmission. Don't forget that in 1974, we beamed a powerful one-time burst of a Megawatt at star cluster M13. 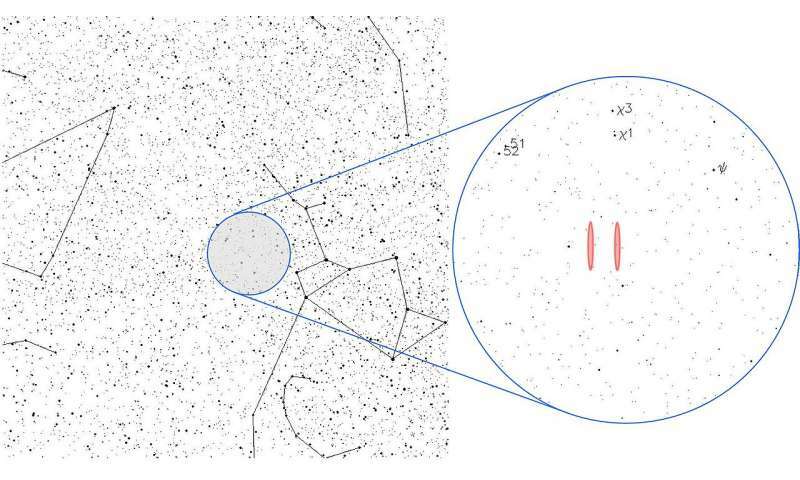 Imagine some astronomer getting that signal and then spending the rest of his/her life in the vain hope of getting another one - never realizing that we only sent the one signal. Surely it would have been known before now if comets emit a radio signal at 1420 MHz. 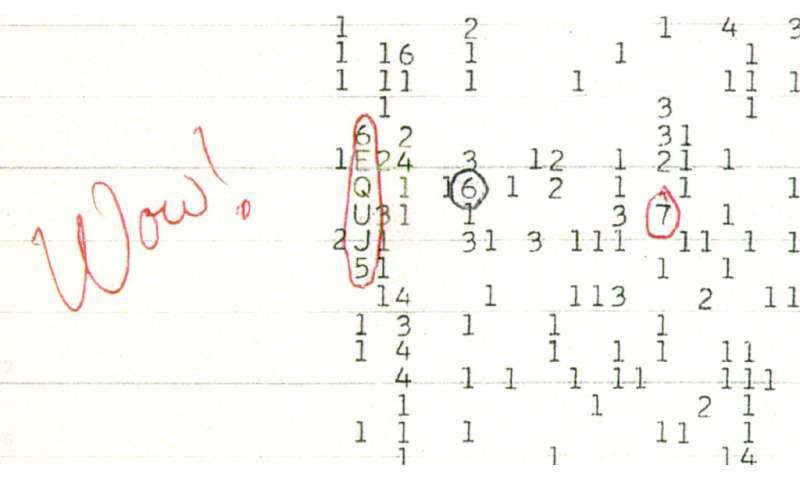 Hundreds of them have been investigated but it took until now to draw a link with the Wow signal? Sounds an over-simplification to me. Don't forget that in 1974, we beamed a powerful one-time burst of a Megawatt at star cluster M13. Hmmmm, M13 is 22,000 light years away. I don't think the signal has reached there yet. Since 1974, our signal has gone only 43 light years or so, and in addition I don't think there is a star that close to the line-of-sight to M13 that could have received it yet. Perhaps I misunderstood your point. It's worth noting that this is one of the spectral lines of hydrogen, as mentioned in the article. Also worth noting that the abstract of the paper says they not only checked their results by moving away from the comet, but also checked other comets and found the same signal. It doesn't appear anyone checked comets with radio telescopes looking for this spectral line until now. The SETI people are constantly searching for this spectral line but have turned up nothing. Which seems unlikely if comets are such a frequent source of Wow-type signals. Let's ask a fairly obvious question here: why would anyone but an idiot send messages in a frequency band emitted by the most common element in the universe and therefore subject to massive interference? Why not choose a quiet frequency band where someone might actually hear you? send messages [...] subject to massive interference? Well, I don't pretend to understand alien intelligence. But if I could encode the message inside a photon property that could be distinguished from the dumb water molecules, the H noise would be a feature not a bug. Like modulating photon spin. Or maybe there's a tech I'm not guessing that sends a coherent signal through the noise, and exploits all that intermediary H as hops in a transmission medium. I know those aren't completely working explanations, but they're possibilities that the H could have some advantages if the unknown means of exploiting them could be achieved. "Relative assurance" - a new standard of proof meaning not much at all. Nice study but poor diction. Let's ask a fairly obvious question here: why would anyone but an idiot send messages in a frequency band emitted by the most common element in the universe and therefore subject to massive interference? To speculate, they could use the interference to decrease the chances of an unintended interception of their messages. A randomly noisy frequency should reduce the detectable range of the signal because all the interference would make it difficult to isolate the actual signal. A related approach might overlay a spread spectrum transmission over a noisy, wide-range frequency band. Again this would be to minimize the chances of unintended interception. I don't think this is actually happening nearby, because I don't think radio-using aliens are anywhere close for other reasons. However, if true, it would tell us a lot about what the aliens believe, i.e., they believe it is better to limit your interstellar communications to intended recipients only. Neither the study nor this article about it claim to offer proof, only an explanation. A better explanation than "aliens", because the comet theory is reproduced. That is what "relative assurance" means. Your complaint is a strawman fallacy. Also I don't think you know what "diction" means. That is an interesting point supporting the utility of radio signals within a spatial range empty of the noise sources. Which made me think that even outside the quiet spatial range of the signal could be differentiated from the noise on the same frequency if the transmitter position is distinguished from the noise sources. So if multiple antennas are used in a phased array, as humans have been doing for some years now, the position of the source can be detected to distinguish it from noisy water sources. And indeed phased arrays can transmit a shaped beam that could point through noisy haze to a single receiver (not phased array) antenna that's pointed along the line. And it seems possible to stimulate distant water sources located in a phased array with say a microwave laser to resonate them into transmitting a shaped beam. Indeed the phased array of comets could orbit. Almost certainly just swamp gas from a runaway weather balloon refracting off Venus. But this one's right on the frequency. That was my point. Ah... I thought you were referring to the general SETI efforts in your post (since you were talking about frequency band and not a specific frequency). My bad. I don't think that comets are te source of WOW. If you want people to read your argument, and perhaps to reply, you'll be better served by posting here at least a summary of your argument. Then maybe people will read your longer document to which you link. Or else you can reply to them again citing it by link. BigEar was a parabolic dish with a beamwidth of DEC 40 arc min/0,67° an RA only 10 arcmin/0,16° or better. It was running in DriftScan. The WoW signal lasts ~72sec. The globe is rotating with 0.25°/min. With this parameters, I calculate the size (RA angle only) of the object. If I assume a small fixed point source far far away, then only the RA width of 0.16° defines the time how long a source can be seen. -> (0.16° / 0.25°)*60 sec ~ 38sec. 72 sec means the object has a diameter. Stellar clouds etc., but no ET in a single solar system far far away! (This would be my argument against WoW from ET) This means that the anglewidth of our object can be calculated as Obj°= ((0.25/60sec)*(72sec-38sec)) -> ~0,14°. The time, which an object of 0.14° diameter can be seen in a DriftScan with a 0.16° window is 72 sec. I'm not that scientifically literate to be honest, but interested in this stuff once it has been dumbed down for me in articles. Have you tried emailing someone at NASA or professional astrophysics community with your calculations? Also you say that your calculations mean it's neither a comet nor aliens, how could you falsify the latter? No ET far far away. During a driftscan, a single point source (continuously transmitting >38 sec) would be visible only for 38 sec in one eye of 0.16° width. BigEar measured 72sec. A value nearly twice the time which really don't fit. So I think we must ignore ET as an explanation, although we don't have any proven alternative. Math delivers mandatory arguments- Thats science. - I will do some emailing to verify my calcs too. I hope he doesn't mind me quoting his reply, but Dr Jerry Ehman (discoverer of Wow) responded to an email query of mine by saying : "No, the cometary "explanation" does not explain the "Wow!" signal. The behavior of a comet does not even come close to matching the behavior of the "Wow!" signal." Dr Jerry Ehman [replied] "No, the cometary "explanation" does not explain the "Wow!" signal. The behavior of a comet does not even come close to matching the behavior of the "Wow!" signal." Good move by you :). Did he (would you ask him to) reply saying whether he'd offer his scientific argument falsifying this report, preferably in direct conversation with the CPS authors of this new paper - or mediated by a journal? A whole SETI industry and his own claim to fame rest on the "Wow!" response remaining appropriate, so his actual reasons for excluding comets are necessary to retain his credibility. You seem to be implying that he has abandoned the scientific method in order to shore up his 'claim to fame', which sounds like a pretty serious charge to me. As a layman I don't consider it my place to get involved, but I've sent him the link to this page so I suppose he can participate if he wishes. No, that's your inference not my implication. I implied only that a "no" doesn't have any scientific weight, and we're discussing science in this thread. The evidence presented looks pretty good from over here. Finding other comets that emit in this band and finding the original comet that was in the right place at the right time and confirming it emits the detected signal too is fairly decisive, I'd say. These guys look to have dotted their Is and crossed their Ts. It wouldn't be a huge black eye for Dr. Ehman not to have been able to isolate such a comet; the equipment simply didn't exist back then. It did, after all, take us 40 years to find out what the signal was. It's also not a black eye for SETI; SETI was preceded by Frank Drake in Project Ozma in 1960, which was a microwave search for signals around the 1,420 MHz "water hole" and this later led to NASA funding for the report that spawned SETI itself beginning in 1971. Dr. Drake is the originator of the famous "Drake Equation" which, though originally tossed off in a rather joking manner, eventually spawned a lot of interesting debate. Personally I'd welcome Dr. Ehman's comments here, and urge him to ignore the trolls; it would not be the first time we've had comments from the actual scientists involved in research in a post regarding an article on this site about their research. I would hope that a minimal standard of decorum would attend such a visitation. I am sure Dr. Ehman is a reasonable man and a scientist above all. It's likely that he would review the evidence from a scientific point of view and I'd like to see what he has to say here. I would love to see Dr Ehman's response in this discussion; I expect it would be highly professional and more impactful than a short email exchange with a single person he doesn't know and who doesn't represent any particular org or publication. His scientific reputation is well deserved, and if he can shed insight into this new explanation for the data that was inexplicable these last 40 years that would be the most meaningful discussion possible in these pages. Dr Ehman is in his late 70s now so we have to be realistic on that score. Not that I believe there's any connection to aliens of course; similar signals would surely have been found by the more wide-ranging searches since then. "We should have seen the source come through twice in about 3 minutes: one response lasting 72 seconds and a second response for 72 seconds following within about a minute and a half," Ehman told Live Science. "We didn't see the second one." The only way that can happen, he said, is if the signal was cut off abruptly. A comet wouldn't produce that kind of signal, because the gases that surround them cover large, diffuse areas. Nor would the comet have escaped from the radio telescope's field of view that fast. Paris said he has shown that comets can emit in that range, but Seth Shostak, a senior astronomer at the SETI Institute, is skeptical. Shostak used to study emissions from neutral hydrogen in the 1,420-MHz range, and is less sure the emission would look right. Comets may not generate enough hydrogen to make a bright enough signal like Wow!. I think I'll try to read the paper (the full paper is available at the link in the article, not paywalled). Let's see just how strong this evidence is. Still looks pretty good from over here, and the follow-on observations of other comets emitting at this frequency is pretty persuasive. I'll withhold any final judgment, but it looks to me like this is a far more solid case than the comments in that article indicate. We'll have to wait for more data to be really certain, but I think they nailed this one. Shostak may not have actually read the paper; something's going on with 266/P Christensen, because it seems to be making a much stronger signal than the other ones. Why that is remains to be seen; that's the third part of Paris' investigation, and we've only seen the first two. What do you think about Ehrman's rebuttal that the original Wow! signal was received only once (presumably by only one receiver horn), but should have been received again (2nd horn) within about 90s? If 266/P is an unnusual (perhaps unique) signaler, that actually might put this investigation back into "Wow!" territory. If it's not "just a comet" (like the others, not interesting), but rather "a special comet", then the original interest could still apply. All Paris would have done is identify the location (and orbit) of the source, but not what makes its special signaling. To go to the (unsupported by specific evidence) extreme: Is 266/P is an alien artifact (creature) in a cometary orbit and composition resembling a comet (perhaps only a gaseous shroud - perhaps camouflage)? That makes Paris' results not "Wow? Meh." but "Wow! Wheee!" Or just a fascinating new comet type. Simply not sure. Faced with two impossibles, you see. One of them is wrong; to say anything more would be speculation. The evidence of the other comets' showing of the same line, but at lesser strength, militates against that. The much higher strength in that frequency of 266/P is remarkable and perhaps unique. Indeed it's what caused the "Wow! ", not just a signal of that frequency. What 266/P has in common with other comets is its H2O composition that's the source of the signal, but the strength means it could be a very different object just also made of H2O.